Back when we first moved into our apartment, Michelle was still a laundry virgin. She, of course, committed all laundry sins imaginable - washing our darks with our lights, and putting the whites right in there without another thought. I am glad to report that she is now a seasoned veteran and will not be making any of those mistakes anytime soon. 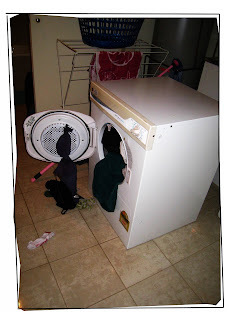 Michelle put two loads' worth of laundry in the dryer one day, and left it to run. I was walking by the room, and realised that there weren't any sounds coming from the laundry room anymore. I opened the door to find the dryer door had opened by itself because of the sheer amount of clothes that were inside it.